Implementing Standardized Work: Writing Standardized Work Forms focuses on the next step of this assessment—writing Standardized Work forms to help identify variability and waste. BOCA RATON, Fla. - May 6, 2013 - PRLog -- The first book in The One-Day Expert series detailed the initial steps that Thomas, a young, high-potential plant manager in an industrial group, took to assess his plant’s situation through measurement of operators’ performance. 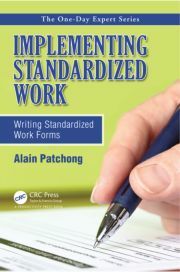 The second book in the series, Implementing Standardized Work: Writing Standardized Work Forms focuses on the next step of this assessment—writing Standardized Work forms to help identify variability and waste. Since an operation can only be standardized if it is repeatable, the most important requirement for a real application of Standardized Work is minimum stability in the process. The book explains how to estimate the stability level of a process by performing process analysis. It also presents a multistage bar called Yamazumihyo to help you perform your own process analysis. After reading this book you will understand how to use Standardized Work forms as the starting point to establishing a safe and ergonomic work place that delivers quality products in an efficient manner.